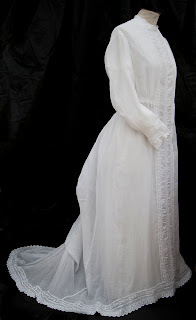 Beautiful Victorian one-piece tea gown to be worn over a bustle. 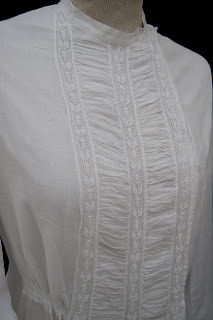 It is made of cotton lawn, and the bodice is lined with a fine cotton. It fastens at the left side of the front with 16 brass hooks, which fit into embroidered eyes. The hooks may be replacements as they look in such good condition. 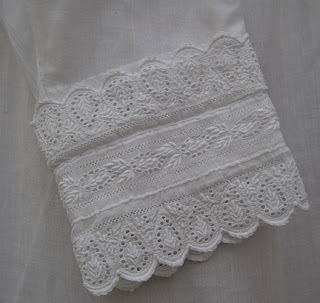 There are 3 strips of broderie anglaise all down the front, with ruched fabric in between, and the hem all round is trimmed with broderie anglaise. The waist is slightly gathered at each side of the front. The back is shaped as shown, and has 6 wide pintucks which extend from the neck to the part which would fit over the bustle. The cuffs are trimmed with broderie anglaise, which can be folded in two different ways (see photos). The back of the dress is much longer than the front forming a train. There are various concealed ties inside the skirt at the back to give the billowing effect of the fabric, and I have shown different effects depending on how tightly or loosely they are tied. The bodice of the dress is lined in a fine white cotton, but not the skirt. The dress appears to be entirely handstitched. In some of the photographs I have used a large bustle underneath, and in others a smaller one. I think the smaller one may be more authentic for the period. These bustles are not included in the auction. In some of the photos the dress is shown reaching the floor all round, and in others I have used a longer petticoat underneath, a few inches of which can be seen beneath the hem at the front, making the outfit suitable for a taller person. I am not entirely sure which way is correct. The petticoats and also the hat are not included in this auction. See my other auctions for similar items. Postage discount for multiple purchases. Everything the seller said. :-) I could easily see this one down by the seaside which is why I added it to the title but it probably was a tea gown.